Yesterday and the day before I was simply too tired to write anything. By the way: Eyal’s show opened yesterday and what I hear on Facebook it was a great success! I will go and see it on Saturday and I am already looking forward to it a lot. So what did the past two days of plotting and tech run learn me? Honestly, the most important message that came across was, that it will be very difficult to find a team like we were in Liverpool ever again. People that really commit to what they do and work up to the highest standards are hard to find. I had to fight with a lot of technical problems. The obvious ones like a broken Hazer, no proper smoke machine, although definitely specified, broken MACs and significant software problems on the ETC Congo. My dislike for this desk is growing. Usually I don’t care about what desk we are using and if the operator knows what he is doing, then there should be no problem at all. But this desk… Weird way of programming and a generally very edgy effects engine when it comes to moves. The HOG might be older, but it is much nicer and smoother. Today is a grey day here in Bournemouth. It is raining and the temperature dropped quite significantly. I will have to re-plot two numbers of the show and start from scratch with them. They simply don’t work. Generally this seems to be the thing with this show. A lot of numbers look stunning but they alternate with horribly dull looks in other numbers. So the balance is very off and today I will personally get my fingers on this desk (no idea if this is a good idea) and start to streamline it all so that it will in the end work out. Today’s post will have to be a little shorter, simply because I am exhausted. 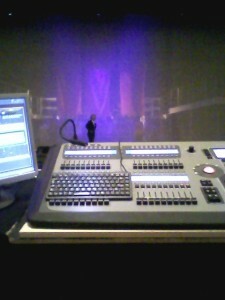 The probably most hated part of a lighting designer’s job is the focus. And this is what I went through today until 11 pm. One could say that it is my own fault as it was me specifying all the lights. And I admit, that there are too many. Somehow the second year in a row, the set has ended up in the wrong position on my CAD plan and so the lighting is squashed up downstage so you cannot fit one hand in between the flybars – whereas there is quite a significant gap in between some bars more upstage. Basically the set is more upstage than it should have been which means my top lighting for the set was morphed into frontlighting and funny stuff like that. The people here are a nice bunch and they are a good crew to work with. Of course nobody likes a focus session and the fact that in this theatre, not everything is in a great shape doesn’t make it much easier. Anyway I keep having this feeling that the language barrier is establishing a little more again. Sometimes I wished I could be a little quicker at repartee than I actually am. 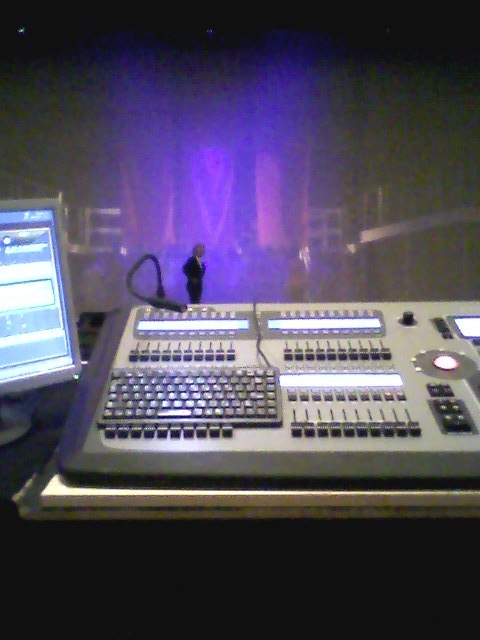 Because, yes, it is stupidly huge rig, and yes, it might have done with some less lanterns here and there, BUT, I am still the lighting designer. And to get this message across without being rude is difficult for me at the moment. From tomorrow on, it will be fine, as the worst part of the physical job – the focus – is done. One thing came into my mind today on my way home, and it is my personal carbon footprint in this production. Not that I feel I have to tune into the general discussion about how “green” theatre can and will be. But it just came to my mind, that it cannot be very environmentally friendly for me to fly over for one weekend, travel through the country for several hours by train and car and do the same thing again a few weeks later. Now I am switching on a maximum of 230,000 watts of lights for 7 days in a row and I am quite sure together with the aircondition in the theatre, we are soooo green… Anyway, just a random thought. So today was quite a long day. And funny enough – it was also quite boring over long distances. The main purpose of it was to see the “final” show in one run. In the rehearsal room that is, which kinda gives the meaning “final” a slightly less ultimate touch. None the less, it has been the casts last run in the rehearsal room and therefore it marks a milestone for them all. For me it was also interesting as the show offers a lot. And it proofed me wrong as I was under the impression that this year I have been very well-behaved with my amount of cues I put in the show. Well, after a break later in the afternoon I realised that Act 1 already adds up to 150 Cues and almost as many follow spot cues, too. So I am actually up for a treat from Monday on. You could call it homemade problems but somehow I always end up in this place. Just knowing the fact that there is almost too many things to plot in two sessions makes me a little less happy about it all – and the feeling that there could actually be more cues and that the show will need more to be good is slightly worrying me. What else happened..? Well, I was soldering the power switch of the MD’s computer back on. For me this is hopefully the most technical I have to get during the course of this show. Now off to a completely different topic, which in a way has accompanied me over the past couple of weeks: Football. Yes, this game where 22 guys are actually kicking a white ball across a bit of grass for about 90+ minutes. You know that I usually have as much interest in this sport as in hoovering (although I can see the point in hoovering). But there are two exceptions to this rule (which also means that it actually is a rule) and that is the European cup and the World cup. And also I am not a very patriotic person (living in Switzerland on the other hand lets me become more patriotic as the Swiss are a bunch of over-patriotic people) I do feel with the German national team then. Or basically over the past years. I have respect for the last two coaches of the team, as they were brave enough to give young and new players a chance. It is always been tradition for the “old” guys to play and the last two coaches went the other way by nominating new players. Which you’d think makes sense. Young people will be highly motivated to score and they have the dynamic and power besides the will to really go for it. This year the team has been brilliant and this is not me (the absolute ignoramus of football) talking, it is what I and a lot of other people have been seeing and talking about. The Germans are the team that scored most goals in this competition and they did actually play absolutely great. So for them, the players, I felt very sorry last Wednesday when a – up to then – horribly sloppy Spanish team found back to its old strength and managed to score the one goal they needed to score in order to reach the final. Tonight “my” team had their mini-final to play for the 3rd place in the competition and they won this probably most useless match in the whole of the World cup. And they did with even 4 of the first-team regulars being replaced due to illness. It does prove that life isn’t always fair and sometimes you won’t reach what you actually deserve. But now that they have reached the final or the semi-final three times in a row, there will be a time when they will get their chance. It is a young team but I like when young people achieve great things, so I take my hat off to their performance over the last few weeks. So I wanna thank the team for giving us an amazing time over here. To finish today’s post I found one of my favourite sketches by Rowan Atkinson. Basically I remembered it because we went to an Indian restaurant just an hour before and the context of football also seems to be right, so here you go. Enjoy your evening or whatever time of the day it is when you read this.